Today’s dish can’t get any simpler. I wanted to have a dinner that is both light and flavorful. Since I got shrimps , then shrimp it is. Grilled shrimp. We have not had this in quite a while. Now, I still need to think of something to go with the shrimp. I wanted the skewer to look, not only pretty but tasty as well. My initial plan was to grill some onions and bell peppers with the shrimp, but I changed my mind. I wanted something else, something different. how this dinner came about. It is such a simple recipe. I rubbed the shrimp real good with the spices and let it rest for a while, allowing a little time for the shrimp to soak in those spice-goodness. 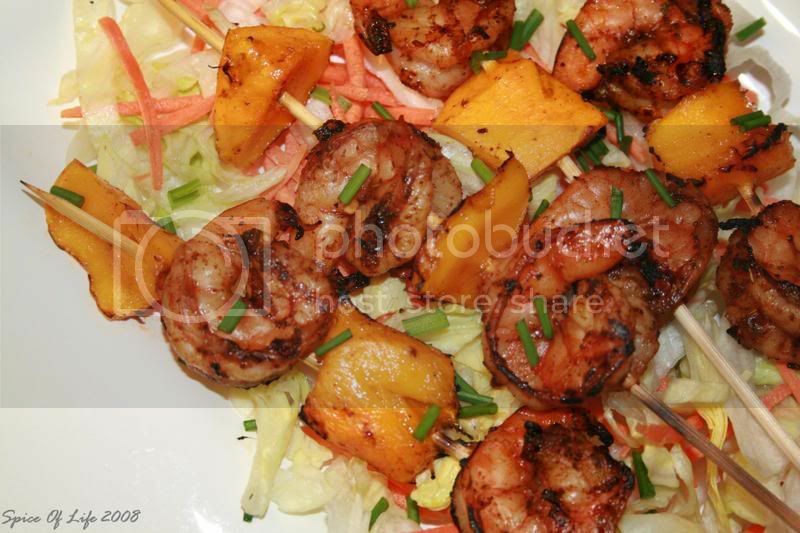 But my anxiety lies in the combination of the shrimp and mangoes. How would they come out, I wonder? I’ve never had grilled mangoes before, so there was an element of suspense in this dinner. (Watch the skewers closely as shrimp cooks in no time.) We shall see (or taste, in this case) the result. And.. drumroll… well, the mangoes tasted real sweet and smokey. It balanced the spicy shrimp very well. I like it. But best of all, I got a thumbs up from the hubby. It’s another successful experiment. 10-12 skewers, soaked in water for 2 hrs. 1. In a bowl mix sugar and the next 5 ingredients (thru oregano). 2. Add shrimp to bowl and make sure that all shrimp are coated with the rub mix. Set aside. 3. In the meantime, peel mangoes. Cut the flesh into 2-inch pcs. 4. 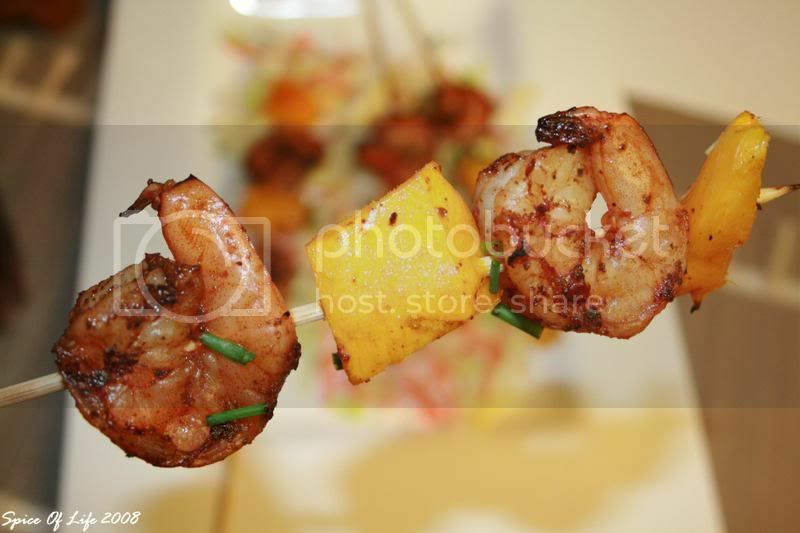 Thread shrimp and mango alternately into skewers, 2 pcs of shrimp and mangoes. 5. Coat grill rack with cooking spray. 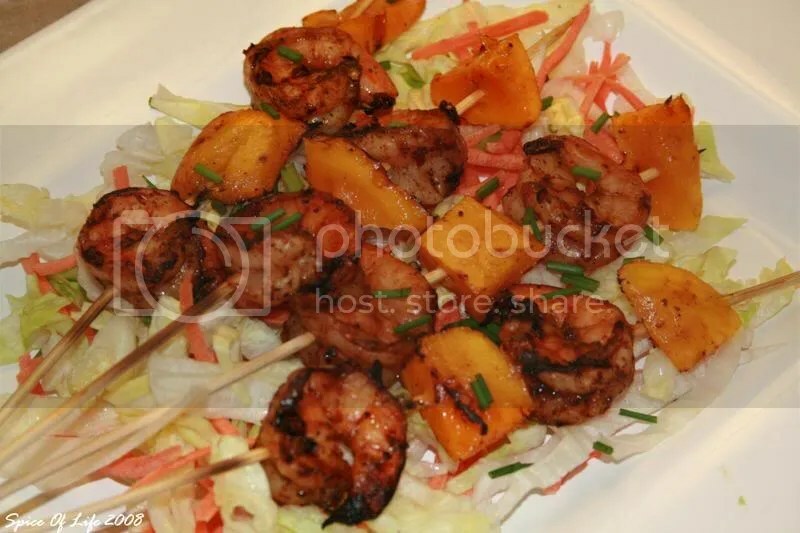 Place skewers on grill rack and cok for 2 minutes on each side, or until the shrimp is no longer gray. 6. If preferred,drizzle a bit of lime over the shrimp. Serve immediately garnished with chives. Hey, it’s Mr. J here again, the mystery chef (or shall I say guest chef in this blog.. hehehe). One day I felt like making a special dinner for my gorgeous wife, so I thought to myself there’s no better way to show my love than to grill up some churrasco, baby…MMMMMM! I love to cook a tasty piece of meat, especially when its got that fat slightly marbled throughout the cut. When grilling, this type of meat is not as easily dried-out by the heat and delivers, in my opinion, a better flavor than super-lean cuts of meat. Follow closely as we cook up some awesome steak and side dishes that will have you smacking your lips! 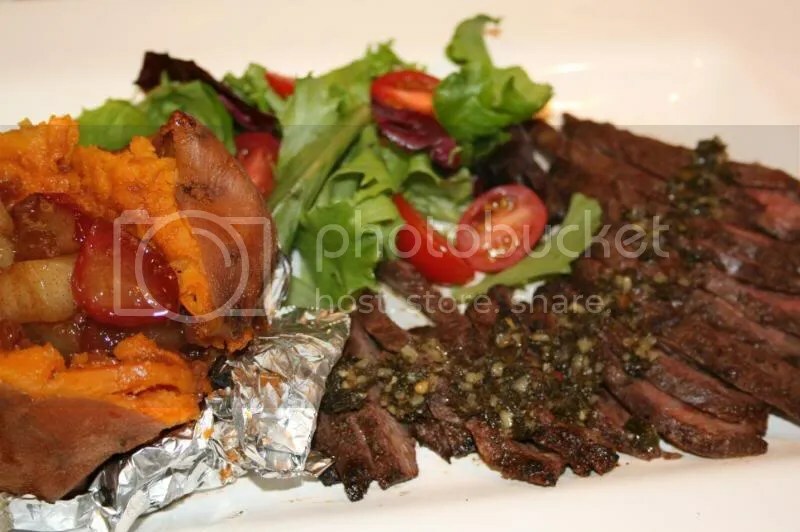 Ready, Set … Remove Churrasco meat from refrigerator to let it come to room temperature. Rub lightly with olive oil, and coat evenly, (on both sides) with the spices: Cumin, ground black pepper, sea salt, garlic powder, onion powder, and some chili powder. Rub well into meat. Now, most recipes I’ve seen ask you to make a special rub for the meat beforehand by combining a long list of ingredients (not that there’s anything wrong with that…LOL), but for me I know what I like and when I am being lazy I can do it this way and still know that I am going to get a good flavor from my steak and seasoning without all of the fuss. I upgraded this dish to almost like a dessert. For starters, get those potatoes cleaned up and dried. Take some butter and coat the outside and wrap in foil before placing them into the oven for 1 hour at 350 degrees. To make the glaze, I melted the butter in a pan over medium heat, then added the sugar and cinnamon to it. When the sugar has melted, I added the apples and just stirred them in to be coated with sweet butter-cinnamon mixture. I didn’t let it stay long under the heat though because the apples are diced, red and delicious,but still not as firm as say a granny smith’s apple — So, it cooks pretty quick. Set the glaze aside until later. When you have about 15 minutes left on your potatoes, get the grill going and start cooking your meat, after all its all about timing. Churrasco time! Go ahead and cook your meat about 4-6 minutes on each side over medium heat, for medium doneness. Don’t forget to get the nice grill marks before flipping! The olive oil will help out with that since it has a lower burning temperature than regular oils. Focus on cooking the steak how you like it, because your potatoes will be ok until you get to them. 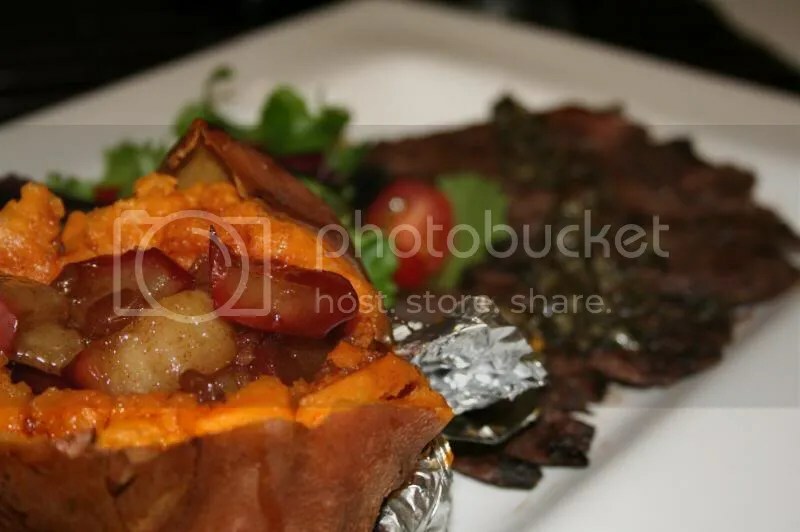 Once the meat is cooked set it off to the side and grab your sweet potatoes. Plate them first, pop ’em open, and add the glazed apples to the top of them. 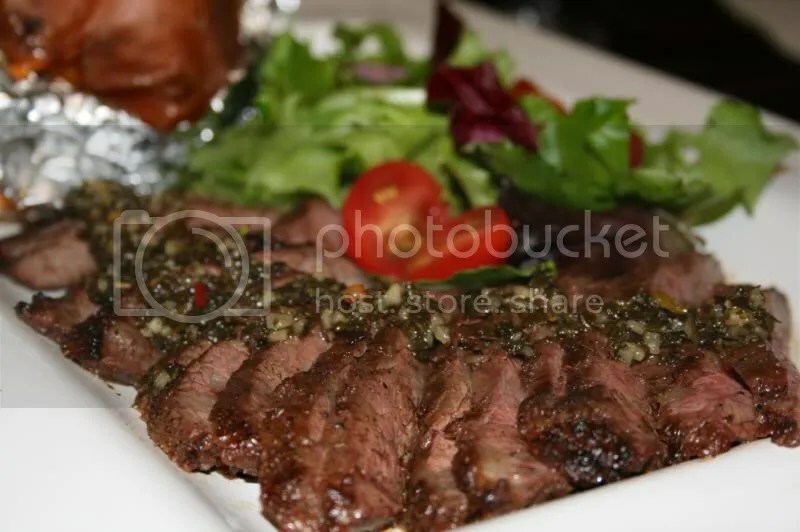 Start cutting into that churrasco and get some of that on your plate. If you have some chimichurri sauce laying around go ahead and add that to your steak for more kick! If not, don’t worry the steak will be great all on its own. We also had a mini-salad with our meal, nothing too special; simply a spring salad mix with tomatoes, olive oil and balsamic vinegar. It doesnt take a lot to have a special meal, just good timing! Enjoy! One of the challenges of cooking in the middle of the week is making something that is simple, quick and yet packs a lot of flavor. And for us, grilling – steak in particular – is the way to go. My hubby’s most favorite cut of steak is rib-eye, but this time, I ventured into something that we don’t usually do – flank steak. I was aware that doing this particular cut would be a challenge as this cut yields a tougher meat, but I really wanted to get acquainted with this part of the cow…hahaha. My inspiration came, once again from Cooking Light magazine. I was intrigued by the chile relish and so I decided to try this recipe. And we were not disappointed. The flavors of this dish are so good. 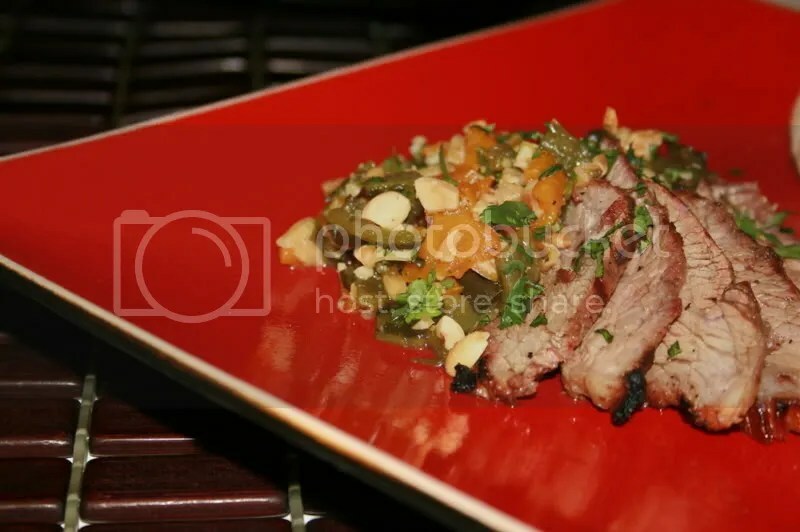 Though if you ask me, I’d rather use the skirt steak (churrasco) than the flank…there I said it… I am now convinced that flank is better used for stewing/braising, but not for grilling. 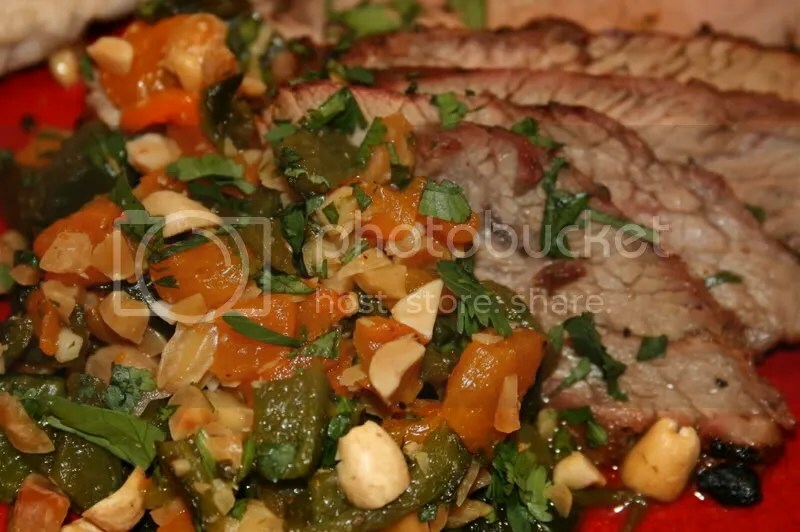 So if you try this recipe (which I hope you would), get the skirt steak. This dish is very good – simple enough for a weeknight dinner but yet, very tasty that you can even entertain with it. 2. To prepare steak, combine sugar and next 4 ingredients (thru ginger) in a small bowl. Sprinkle steak with sugar mixture. 3. Place steak on a grill rack coated with cooking spray. Grill 6 mins. on each side or until desired degree of doneness. 4. Cut steak across grain into thin slices. 5. 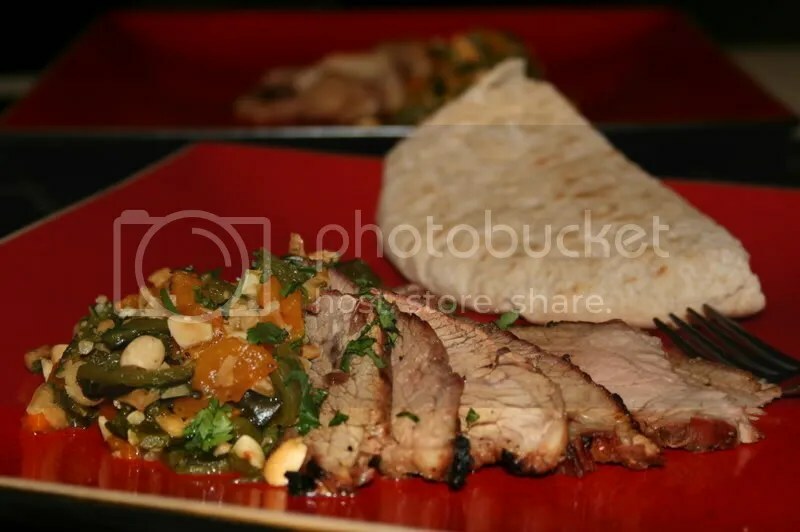 Serve with relish and toasted pita. 2. To prepare relish, cut chiles and bell pepper in half lengthwise; discard seeds and membranes. 3. Place halves, skin side up, on a foil-lined baking sheet, flatten with hand. 4. Broil 15 mins or until blackened. 5. Place in a zip-top plastic bag; seal. Let stand for 15 mins. 7. Combine chiles, bell pepper and next 6 ingredients (thru garlic) in a small bowl; toss well. Set aside till steak is ready. Serve with steak. No, I didn’t. Though by the time I was done cooking, it seemed like the house was on fire. The smoke got so thick in the kitchen that my husband had to open up the windows! I was just going through an old issue of my Cooking Light magazine when this recipe caught my attention. I marked it for future reference, but then my hubby wanted to eat a light chicken dish for dinner tonight. And so I decided, now would be a good time as any to have this dish. Most of the ingredients are already in my pantry / fridge, so I only needed to get a couple of things. I made a trip to the Asian store to pick up rice noodles, and to our regular grocery to get the chicken. 2.To prepare sate, combine chicken and next 6 ingredients in a med bowl. Let stand for 10 mins. 3.To prepare sauce, combine 1 tbsp brown sugar and the next 5 ingredients in a medium bowl, stirring until sugar dissolves. 4. Thread chicken strips onto each of the skewers. Place chicken on grill rack coated with cooking spray; grill 5 mins on each side or until chicken is done. Serve chicken with sauce and rice noodles.For the noodles, just cook according to package directions. I had to make my own changes of the above recipe due to what I have on hand. First, I used regular soy sauce. Second, I have a natural peanut butter – not chunky but not as creamy as Smucker’s for instance. Third, I added the lime juice to the satè marinade as I wanted a stronger lime flavor. Fourth, I used fresh ginger instead of a bottled one. This was a nice light dinner that my husband really liked. I served it with a Spicy Cucumber Salad, recipe of which you’ll find in my next post. By the time I was done cooking, it seemed like the house was on fire. The smoke got so thick in the kitchen that my husband had to open up the windows! 4. Thread chicken strips onto each of the skewers. Place chicken on grill rack coated with cooking spray; grill 5 mins on each side or until chicken is done. Serve chicken with sauce and rice noodles. For the noodles, just cook according to package directions. I love it when my husband and I “flow” together – when there’s meeting of minds – it’s incredible. The hubs was scheduled to work today, Saturday. While I was out for my grocery shopping, I thought that I’d prepare baby back ribs for dinner. It would be a good treat for him after a long hard day of work. So I bought some ribs. As if on cue, I received his text asking me if I wanted to have some ribs for tonight. Hmmnn..… I know my husband! After cleaning the ribs (took those white membranes off), I placed the ribs in a big pot with water enought to cover it. In the water I also added some garlic cloves, one onion quartered, salt and whole black peppers. I just let the pot simmer until the pork got tender and the flesh are almost coming off from the ribs. When the ribs were ready, I turned off the heat and just let them cool down for a few minutes. Since my hubby is the master griller, then he grilled the ribs up. In the meantime, I prepared my own barbecue sauce, which is from Ina Garten of Barefoot Contessa’s recipe. The only thing different I did to the recipe is by adding 3 pcs. of bay leaf. The recipe makes a lot of barbecue sauce, so if you’re not making a whole batch of meat, then I recommend cutting the recipe into half.